Feast of St Ignatius of Loyola. Today shall be a big day for our new pope, Francis. As a Jesuit, he will be celebrating the founder of his order, St Ignatius of Loyola. Ignatius was born in 1491, a year before Columbus discovered America. As a young man he was a soldier and during a time of convalescence after an injury he a conversion. Reading the lives of Jesus and the saints made Ignatius happy and aroused desires to do great things. Ignatius realized that these feelings were clues to God’s direction for him. The gospel of today's feast talks about our human capacity to reason things out. The Jesuits are a very strong missionary order, vowing to go wherever the pope sends them, that is why it is apt that Ignatius was born a year before Columbus discovered America. Pope Francis will most likely be thinking of where God had sent him; to be the shepherd of his flock all over the world. It is a mighty task and yet his Ignatian spirituality will tell him that God did not call him to this task without giving him the grace and ability to do the work. It is somehow apt in these days when atheism appears to be the new religion that at the head of our Church we have a man from one of the great 'thinking' orders of our faith. Francis is sound in his theology and teaching. In this modern time, we hear all this talk about being non judgmental and there being no hell or if there is a hell then there is no one in it. To me it sounds like we are trying to exonerate ourselves from all responsibility for our actions. While it is never our place to judge someone it is also never our place to exonerate their actions either; doing both is playing God. Did you hear yesterday's comment by Pope Francis about 'who am I to condemn homosexuals'? The media had a frenzy on this as though what Francis said was something new and different from Catholic teaching. Judgement of person belongs to God only because God is the only one who can see into our hearts. However, our actions are open to scrutiny. Though we have to remember that a bad action doesn't mean the person is a bad person. In today's gospel Jesus explains the parable of the darnel where the good seed planted by the farmer has been mixed with the bad seed sown by the enemy. 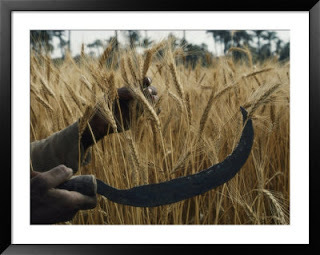 "The sower of the good seed is the son of God. The sower of the bad seed is the devil," says Jesus. In the end the people of the good seed shall go to heaven.....the rest? Well who do you trust? Today's philosophy or Jesus'? 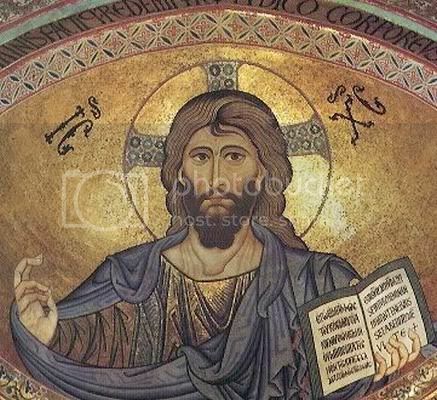 In the icon, Jesus is shown holding an open book and his right hand is held up with two fingers extended as if he is stressing a point. It is a masterpiece of symbolic art. This is something that we seldom think of when it comes to Jesus, how wonderful a teacher he was. In today's gospel he uses two simple everyday events to bring home deep spiritual points. The first is the mustard seed, which though very small, grows into the largest shrub in the land. The second is the image of a little yeast making the bread rise. Even today when we understand the processes that make these events happen they are so strange that they still make us think of the power of the Kingdom, which arrives in our heart as a single word or idea but which if we listen to it, becomes the whole focus of our lives. In order to be taught by Jesus we have to be willing to listen and learn. If we approach our subject from an 'I know all' attitude then Jesus cannot get through to us. We need to be like little children, willing to hear and listen, to be taught and to obey what we are taught. If we are not, then the words of Jesus shall pass us by. For those that are wise...the words of Jesus are rich indeed! Very little is known about the parents of Our Lady. Most of what we have comes down to us in the way of legend or folklore. The parents of Mary are more celebrated in the Orthodox church than in the Latin and they have much more in the way of tradition about Mary's parents. "Sts. Joachim and Anna had been married for fifty years, and were barren. They lived devoutly and quietly, using only a third of their income for themselves and giving a third to the poor and a third to the Temple. Joachim had done this since he was 15-years-old, and God multiplied his flocks, so the couple was well provided for. They longed for a child but remained childless into their old age. When they were in Jerusalem to offer sacrifice to God, the High Priest, Issachar, upbraided Joachim, "You are not worthy to offer sacrifice with those childless hands." Others who had children jostled Joachim, thrusting him back as unworthy. In despair, he consulted the geneological records of the tribes of Israel and discovered every righteous man in the nation had been blessed with children, except him. This caused the aged saint great grief, and he and his wife left with heavy hearts. Then the two of them gave themselves to prayer to God that He would work in them the wonder that He had worked in Abraham and Sarah, and give them a child to comfort their old age." This long quote from an Orthodox source shows us several things. This is a lovely feast for it calls on us to reflect on the life of Mary before she was called by God. The feast also encourages us to reflect on family life and to think of our own family. Since Mary is our Mother in heaven we feel part of her life, and we join in the joy of her celebrations as her children. God is family, three persons in one. Our faith is a faith of community, where family and community prayer is central. This feast brings us right back to the family of Jesus, to even before the Annunciation, to the very heart of Mary's own family. Only our God would think of giving us such a beautiful feast! Nowadays St James is best known through the 'Camino de Santiago' the long walk through France and Spain to his shrine at Compostella on the Atlantic coast in Spain. James was one of Jesus' close group of friends along with Peter and John. He was always among the group who were called to witness Jesus' times of glory and pain. He was also with the Lord in the garden on Holy Thursday night. He was the first of the apostles to be put to death being beheaded by Herod Agrippa in AD 42. It is said that Herod saw that the stoning of Stephen pleased the Jews so he decided to behead James as a sort of bonus for them. Then the other apostles are angry: they all want a piece of the action. The human-ness of the apostles is nice to see. We all struggle with ambition and greed and all the other human traits and Jesus continues to love us through it all! Today we have the parable of the sower. 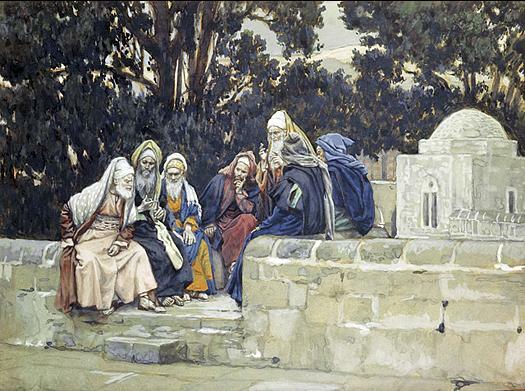 Later on Jesus explains the parable to the disciples so we shall leave that to later. However, I always find something disturbing about the parable of the sower. It is the same as the parable of the talents, they always leave me feeling a little uncomfortable. Perhaps there is something in the lines that I know applies to me. The reason that these parables make me uncomfortable is that I know in my heart that there is more that I could be doing to obey God, or that there are things that I am doing that I should not be doing. That's what parables do; they speak to a part of us that is in touch with God all the time and they highlight those areas of our lives that are at odds with God's life. I know the answer, but I still have to ask it; that's the type of guy our God is; he keeps needling at us 'til we are ready to face the truth within ourselves. This is one of those readings that people who like to ridicule the Bible use frequently. It is the story of the parting of the Red Sea and those of an atheist mindset love to point to this story to show how silly the Bible is. There are a couple of points to make. First there are certain physical conditions, although wind speeds and direction have to be precise, when the Red Sea actually does part. Second, why shouldn't God do a miracle if he wants? But the third point is to look at the story from the point of view of the Jewish people's mindset: something dramatic happened at this time in which God intervened directly in the lives of the people and the history of the nation. That is the way that I tend to see all these stories; they are the response of a people to the work of God in their lives. They tell of the wondrous deeds that God has done. We moderns tend to be too fact based; we never stand in awe of the wonderful work of God in our lives. Being fact based we narrow our view; God is so much more than a mere list of facts. He is behind everything, not just this or that, but everything. If we would only widen our horizon and see God as Lord and master of all. Or if you want to get stuck in a world the size of an atom, then so be it, but you miss so much of life's glory by limiting your vision and the work of God. There are probably more theories about Mary Magdalen than there are about anyone other than Jesus himself. In actual fact we know very little about her. It is assumed that she is the woman from whom seven demons were driven out but scripture does not identify the person. What we do know about her is that Mary was a follower of Jesus who traveled around the countryside with his group. Mark 16:9 tells us that she was the first person to see Jesus after the resurrection and John tells us that she stood at the foot of the cross as Jesus died. For myself Mary speaks one of the most beautiful lines in all scripture. When she sees Jesus and mistakes him as the gardener and the gardener asks, "Woman, who are you looking for?" Mary gives the most wonderful answer: "Sir, they have taken my Lord away, and I don't know where they have put him." It is the tenderness, familiarity and love of this sentence that makes it so special. There is a tender closeness that betrays a deep love and then there is the response of Jesus when he says "Mary" in some familiar and friendly way. There is obviously a very close bond between Jesus and Mary. It almost makes you envious! This is the day that the Lord officially went on the run form the Pharisees! Having heard Jesus proclaim the he was master of the Sabbath in the previous few verses the Pharisees now decide to plot to kill Jesus. This is a turning point in the gospel; up to now the Pharisees were still deciding what to believe about Jesus but now they have made up their minds. In their eyes, Jesus is blaspheming. By claiming to be Lord of the Sabbath he is making himself equal to God. From now on Jesus goes about secretly, telling his disciples not to make his whereabouts known. It is always the same when God comes among us; we have to make a choice of whether to accept him or not. The Pharisees made their choice and we make ours. Strangely there are still many people who choose not to believe in Jesus; yet he calls to us at all times, but somehow some people won't acknowledge his voice. From Jesuss time until now, the characters have changed but the story and the choices we have to make stay the same! There is a very important message in today's gospel for us all; we are not to become slaves of the Law or of nature. Jesus and his disciples are walking through the fields on a Sabbath day. They are hungry and so eat the ears of corn that are growing in the field. But to do so they have to pick the corn; this is work and thus the Pharisees object. Jesus replies with a story about David, the great king of Israel. He tells how he went into the temple and ate the holy bread when his men were hungry. Jesus even goes further and says that there is something greater even than the temple here. He is referring to himself. God lived in the temple but now God has come among you! Jesus pointed out that the Pharisees were being strangled by the Law; it left no room for love or the importance of people. Jesus also showed that people come before the Law and that nature is there to serve man, not man serve nature. We are stewards of this world with a duty to use our resources sensibly, but in the end the needs of the people come first. This passage speaks to people of all times.